Every year I spend a December day baking an assortment of cookies and bars for gift giving. Packaging them up is always the most challenging part. This year I came up with a solution from my recycling bin. I had wanted to whisper my idea to you all week, but wasn''t sure if I could pull off these cookie house as nicely in reality as they were in my head. Turns out they're super easy to make! You've got to try these... no excuses not to! Everything you need is right in your house. Milk cartons work so well for cookie transport because they're sturdy and grease proof. I originally was going to make some little baskets by just cutting off the tops and punching holes for handles, but the natural shape of each carton screams house, and then last week I saw these. I had no choice... houses it was. 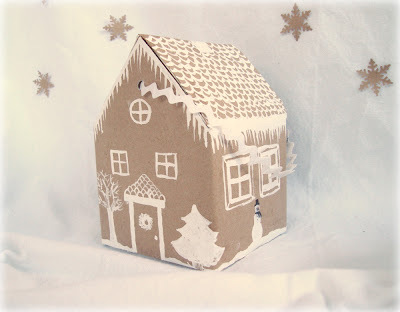 Covering them with brown Kraft paper transforms them into gingerbread houses waiting to be frosted- with white acrylic paint. Great project to set out for children. Cover a bunch of carton houses and set out some paints for them to add windows, doors, etc. So here's how to make your own. The first one will take a little longer as you figure it out, but the following ones will fly together in no time. 2. Cut all four sides down to the folds and remove. 3. Snip directly down all four corners and fold two opposite sides together to form a roof. 4. 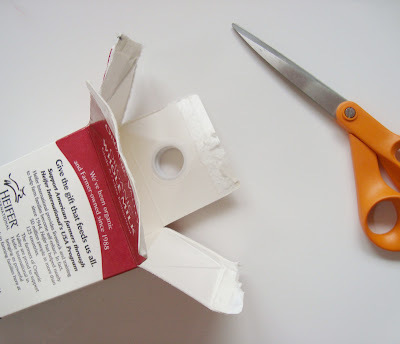 Place the carton on a flat surface and hold the roof pieces together to form the template for cutting the A-framed sides. 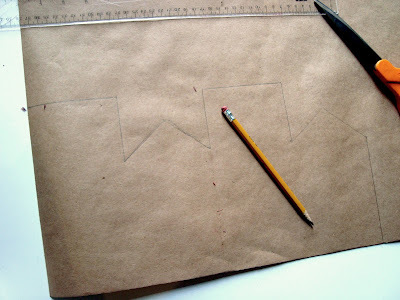 Trace the triangle with a pencil and cut. Once you've made this shape, you'll see that you can adjust them to any height you desire. If you choose to adorn them in paper proceed to the next step. 5. 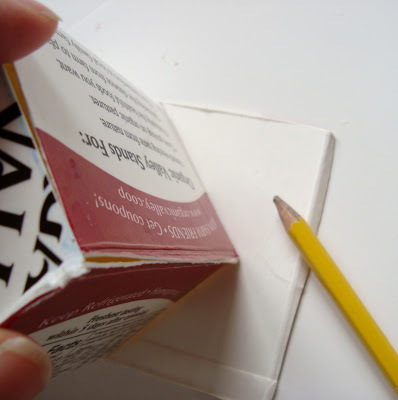 Place your carton corner on the corner of your paper. 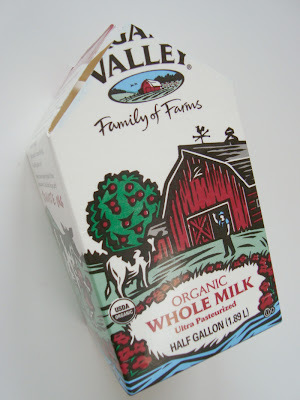 Trace the shape of the carton as you carefully roll it over for all four sides. Add an inch in height to all of the flat edges to ensure extra for folding over. See below. 6. 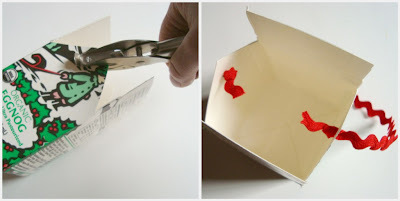 Cut out paper and adhere with glue or paste. I ended up using a combination. Fold over flat top edges and secure with clothespins until dry. 7. When dry, paint and decorate. 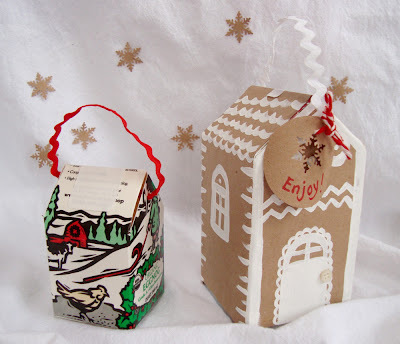 Whether you make gingerbread houses or keep it a simple carton... you'll need a handle. Punch holes into the A-frame and tie on a ribbon. 8. Fill with cookies! 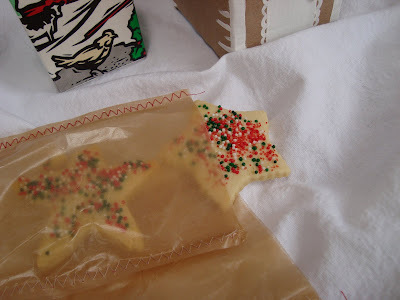 You can make little wax bags to separate the cookies by folding over a length of wax paper and zigzaging the sides shut with peppermint thread (red thread and a white bobbin). Seal each house's roof with a little label or sticker. Have fun! Oh So SWEET!!! 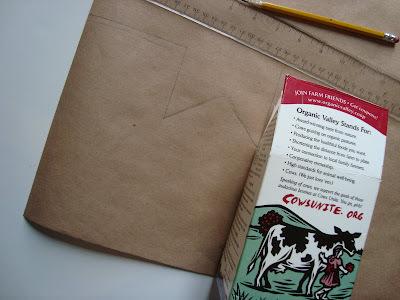 We go through SO much milk, it would really be fun to make some of these from the cartons. I'd be quite happy sitting them along the mantle like a little gingerbread village. You could also, I guess, stick beads and things to replicate candy on it...fun. I'm set to do the Christmas craft for my daughter's class-I wish I'd seen this before I bought all the other supplies!!! So very cute! Thank you! Thanks for the great idea - and I love how you sewed bags out of wax paper, very cute! I love them! Now just learn how to make good cookies. Really have to ask dear boyfriend to teach me. Cause I do think I'm gonna make a sweet house like this. JUST WHAT I WAS LOOKING FOR!!! have made special mini mince pies and wanted to share with a very good neighbour, but did just want to hand them over on a plate...i guess you could easily just cover the 'houses' with some nice wrapping paper and embelish. you are fabulous. i love these. especially the stitched parchment paper. looks like we have to make cookies now. this would be really sweet with cinnamon/applesauce ornaments in it too. thanks for the idea. happy creating! oooh they are so nice and charming too! you're so creative! very good! Brilliant! I never would have thought to make houses for cookies, but I do use them to make trays when I am sprouting seeded. I turn them on their sides, cut about a 1/3 off the whole carton (what would be the side if it was upright). Then punch holes in the bottom and line up toilet paper rolls cut in half. 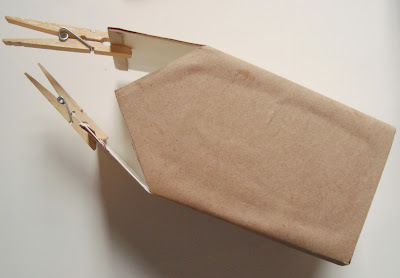 Once you have your "boat" prepared you just fill it with seed starting soil and put the seeds in the tp rolls. When they are ready to transplant the tp roll comes out, the milk carton boat goes away. Frugal and smart, but not as smart as you....keep it coming!! THAT is so creative, so smart, I love it :) These would have been cute all on their own, but the fact that you used them to transport cookies really takes them over the top. Perfect! not going to get to this one this year, i don't think but i'm putting it on the backburner until next year. although variations on this would be fun any time of year. "peppermint thread": i thought for a second you were using flavored tooth floss! Thanks very much for posting the tutorial. Hi Maya, Thanks for another inspirational make - I'm still in love with the Easter baskets you made! Our recycling centre takes milk cartons so that's where mine usually go but I'm definitely holding some back for this project. Need to make more time though as I'm busy covering and decorating wash tab boxes with recycled brown paper for seed storage! Genius! Thank you so much. I'm going to do this with a three-year-old I teach. Well, I guess I'll do all the work and he'll do all the decorating. I never noticed but those milk cartons ARE a nice size for gift packages. Great idea! always, you come up with such great ideas! Aww, that is so cute! What a fun idea, I love the houses! Thanks so much for this, I'll be linking. Wow, this is an awesome idea..very cute! Peppermint thread!! I love it!! I love the idea and the covered and uncovered options. The Organic Valley carton made a great image for a house--it reminds me again of your eye for choosing graphics from coffee sacks, etc. So clever. So simple. So stinking cute. You've done it again! oh, love love love!! 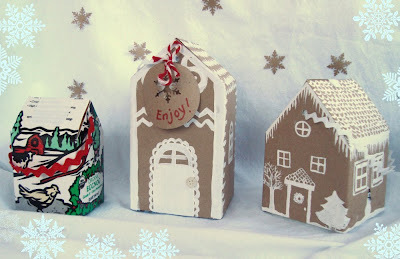 i had to post/share this to believing nature (http://believingnature.wordpress.com/2009/12/15/milk-carton-cookie-houses/) if you don't mind. again, love!! Wonderful idea and so beautifully executed! I love these Maya. So effective & just so lovely. These are awesome Maya! You rock! I just love this idea! Beautiful but also practical. I heard your interview on Craftsanity and that brought me to your blog. Glad I found you. I like Georgia's idea of adding beads and I wonder if you used Elmer's glue (or something similar)instead of paint, if you could get a dimensional quality like icing. I'm off to try! Thanks for the inspiration. Cool idea! thanck you maya. Cool gift ideas! Thanks for guiding me through this. I will try to make something like that this weekend. Keep posting! thanks for showing the art. im planning to make one like this for school.